As I write about the foods I prepare, I find myself wanting a simple phrase to describe the organizing principle behind my ingredients. They are most often some combination of fresh, local, unprocessed (or minimally so), organic, free-range, grass fed and relatively “whole.” You won’t see long mysterious words on the ingredients list. They don’t contain Genetically Modified Organisms (GMOs). You can see examples on my shopping list. I’ll call them “real foods” for shorthand – that’s so much easier than a long list of qualifiers! Some call it iced coffee, but at my house it’s just cold. Every couple of days, I make a batch of hot coffee in my much-beloved glass Chemex. Even though I rarely drink more than one cup, I always make at least two. That un-drunk cup goes into a glass peanut butter jar (one of a dozen or so in my cupboard) and then into the fridge to be enjoyed at breakfast the next day. I used to pack a glass with ice and dress it up with raw sugar and milk or half and half, sometimes a splash of vanilla extract. But then the automatic ice-maker broke (as they always seem to do) and I just never get around to making cubes the old-fashioned way. At some point I stopped the milk, then the sugar, enjoying the deep roasted notes of my favorite French Roast from Jim’s Organic Coffee. 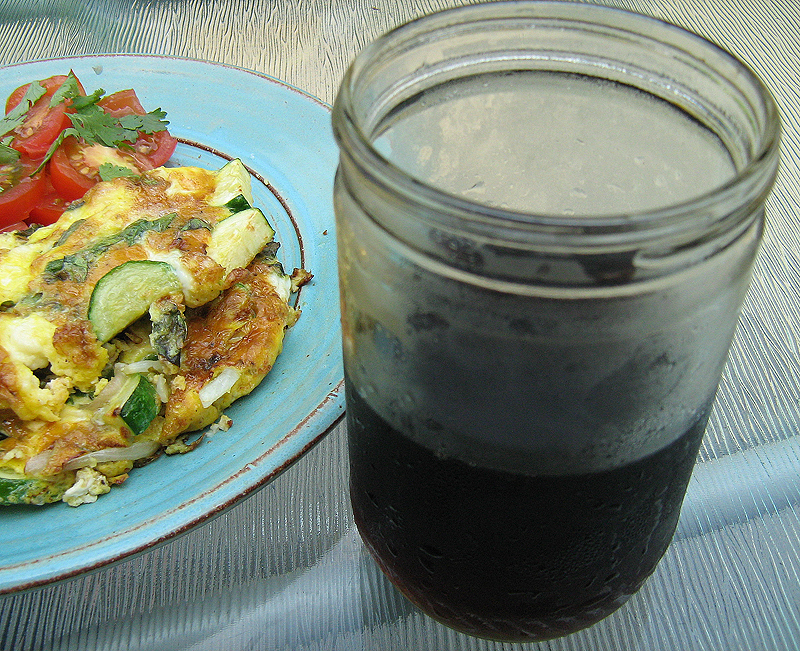 Sipping cold coffee from a cold jar, over breakfast on the back deck, is one of those truly delicious simple pleasures of summer. If I were to start a list of Five Minute Foodisms, I’d put this near the top: always think about your next meal. Some of the biggest barriers to eating well are time and energy. So, save yourself a little of both by preparing some of your next meal along with your current one. If you’re boiling eggs, chopping vegetables for a stir fry, making a sauce or washing greens for salad, prepare a little extra! At least enough for another meal or two. This is a routine time-saver for me. If I’m cutting up tofu or tempeh for a meal, I cut the whole block and store the rest. If I’m cleaning lettuce, I wash the whole head. If I’m slicing into an onion or tomato, I slice or chop the rest so it’s ready for the next meal, even if I’m not sure what it will be. When I get home from a long day of work, or am feeling lazy on a day off and don’t know what to make for dinner, I can say, well, I’ve got some chopped scallions and tomatoes…maybe a nice salad? Or an easy omelet? Today I started building a salad with some lettuce, arugula, tomatoes, cucumbers and scallions. I washed extra lettuce and cut some extra scallion tops and threw the rest in containers. I threw in some tofu for protein and cubed the rest of the package. 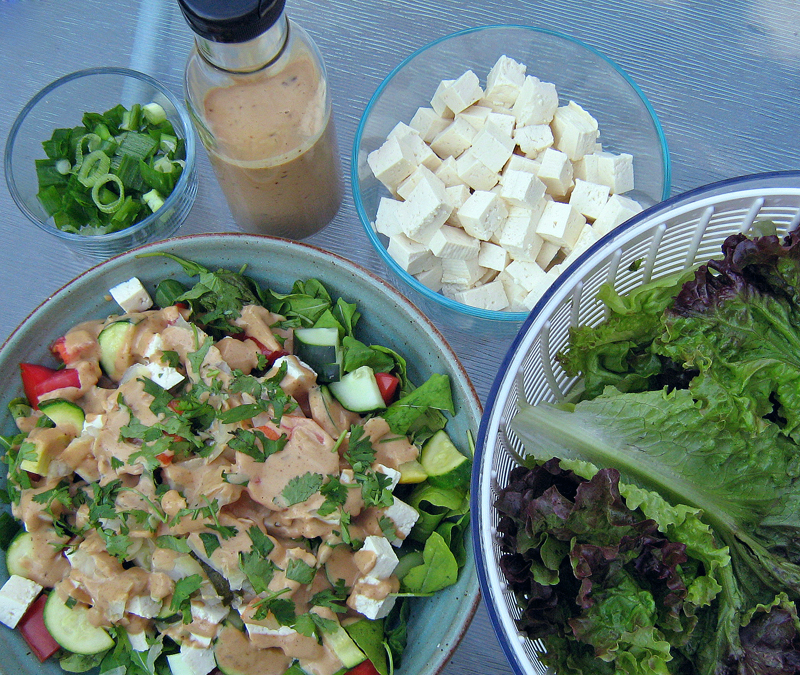 Then I whipped up about a cup and a half of peanut dressing, dressed my salad and put the rest in a glass bottle. It will keep in the fridge for weeks, and I’ll drizzle it over salad or one of my quick vegetable, grain and protein concoctions. Cooking this way provides me with double the pleasure: a good meal in front of me and anticipation of the next one! 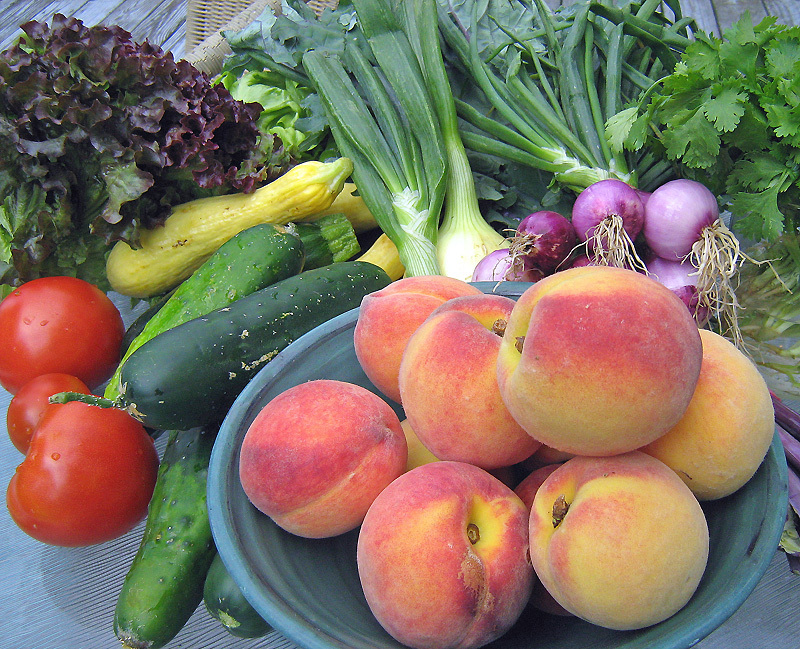 Today’s farmers market booty: lettuce, kale, white onions, “purplette” onions, cilantro, summer squash, zucchini, cucumbers, tomatoes & peaches. This is what you’ll see me cooking with this week, along with a few tomatoes, basil and string beans from my container garden. Stay tuned. Break a couple eggs, not your budget! 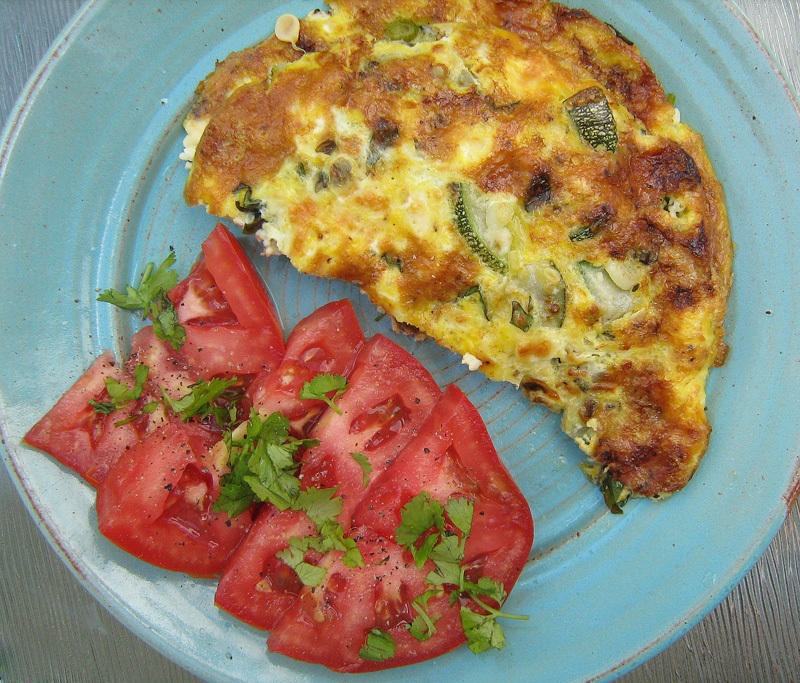 A simple fritatta, made with local eggs, feta cheese (from grass fed cows), organic veggies and sliced tomatoes on the side costs less than $3. Eggs have been called the “perfect food” for their high food value and amino acid profile. I made this with zucchini, scallions and basil. Vegetarian & and gluten free. Yum! I will admit a deep prejudice against certain baked goods. Cupcakes, in particular. Don’t get me wrong. I love butter cream and cakes and scones, fancy pastries and home-baked delights as much as the next gal! I’d probably eat them daily, IF they were good for me. There are soooo many (very talented) cupcake-baking food bloggers out there. Who doesn’t drool over the gorgeous photos of cakes, pies, brownies, cookies and ooey-gooey frosted delights that seem to call out, when the world disappoints you, I will always be there for you… After all, don’t we all deserve a little daily “comfort” in our busy, stress-fueled world? But even though these homey baked goods may be of higher quality than your grocery store variety, and created with the best of intentions, they can’t be called “healthy” by a long shot. And the “cupcake trend” reveals a problem with American diet and lifestyle generally: much too much of the wrong thing. Eat too much grain, particularly refined white flours, and I get cranky. And achy. And tired. As for sugar, I have a seemingly endless capacity for consuming it when my super-sensitive craving mechanisms are triggered. Alcohol, particularly my much-beloved red wine, really brings out the sugar monster in me. Sugar is a powerful drug, confirmed by studies on addiction – and my personal observations. When I “detox” from sugar for 5-7 days, the demonic cravings go away. Just like that. A classic addiction pattern that mimics the withdrawal from nicotine and other drugs. As I’ve gotten older, I’ve gotten better at doing the right thing for my body. And (sigh) that means consuming far less alcohol and sugar to keep those addiction demons at bay. It’s one of the ways that I, now in my mid-40s, have actually matured. But, boy, it’s taken a long time to get here! Okay, you might say, but don’t be such a killjoy! I’m not as sensitive as you are! White flour and sugar don’t make me feel that bad. I can quit anytime. True, maybe, for some of you – but, then, that doesn’t mean sugary baked goods are good for you. Simple truth is, NO ONE should be indulging in them daily. Nor should we be encouraging cupcake-obsessive eating habits with our kids or daily cookie raids with our coworkers. More Americans than ever are overweight or obese. Among the root causes are poor diet, characterized by over-consumption of sugar, white flour, refined grains and the inexpensive, pro-inflammatory vegetable fats found in most commercially made (and many homemade) baked goods. Obesity presents its own problems. But it is also one of the chief risk factors for Type 2 diabetes, which has reached epidemic proportions in the U.S. According to the Centers for Disease Control (CDC), “If current trends continue, 1 in 3 Americans will develop diabetes sometime in their lifetime, and those with diabetes will lose, on average, 10–15 years of life.” And, with the disease comes a range of unpleasant treatments and the risk of severe health complications, which assure that such a short life will have its share of pain and misery. We can and must put a stop to this disturbing trend now, by taking back our own bodies. We all deserve food that tastes good and is good for us! But, back to the cupcakes – I don’t really think that cupcakes, nor their well-meaning bakers and admirers, are evil. Or to blame for all our dietary woes. I think it’s okay to indulge now and then – maybe even once a week for the not-so-sensitive. But given the current crisis in diet-related health, I feel that cupcakes and other baked treats need to be viewed for what they really are: a delicious concoction of non-essential dietary ingredients that offer little health or nutritional benefit. So, what’s the healthier alternative for those looking for a bit of sweet foodie comfort? Fresh fruit probably tops the list. At first, my sugar demons screamed, you’ve got to be kidding me! You’re swapping my chocolate chunk cookies for an orange? But they quickly settled down and then a citrus fruit, some pineapple, a slice of watermelon or fresh berries became my new sweetest pleasures. Or a dish of plain yogurt with some fruit or a spoonful of preserves stirred in. Even some herb tea with a tiny bit of honey takes the edge off my after-dinner sweet tooth. Some nights, much to my surprised delight, the demons don’t pipe up at all and I get through the day without any sweet treat. And on those days, I feel such a delightful sense of freedom! It’s not unlike what I felt when I finally stopped smoking: you will not rule me, addiction! I am master of my own destiny! I will always reserve my right to enjoy the occasional butter-creamed goody, its sensual pleasures and emotional comforts. And even to over-indulge on rare occasion. But most of my diet is from fresh, wholesome, unprocessed foods. When you eat foods as close as possible to their natural state, you immerse yourself in a diverse array of colors, textures, smells and wonderful tastes – and all of the health benefits that go along with them. It is a profound act of self-nurturing. True “comfort food” nourishes the body and the soul. Here’s one from the Five Minute Foodie page on Facebook in a more traditional recipe format. I used Tinkyada brown rice elbows (gluten-free), but you can use any pasta you like and any vegetable that can be quickly blanched. Broccoli, cauliflower, spinach or chard would all work nicely too (greens will need less time in the water – perhaps just a minute). You can vary the cheese and herbs as well. 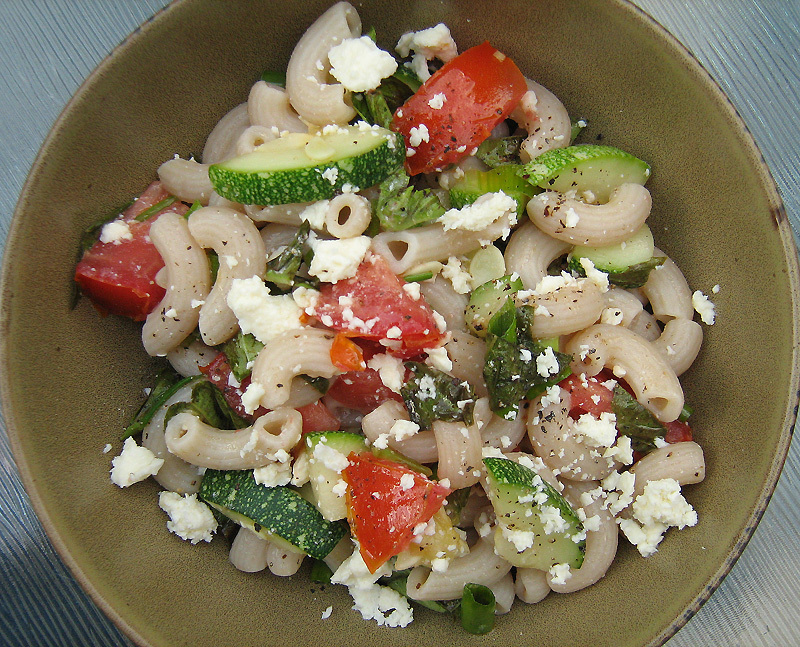 A nice, easy summer meal that’s just as delicious as a cold pasta salad the next day! Put the pasta on to boil. Add veggies during the last 2-3 min of pasta cooking time (less if using greens). 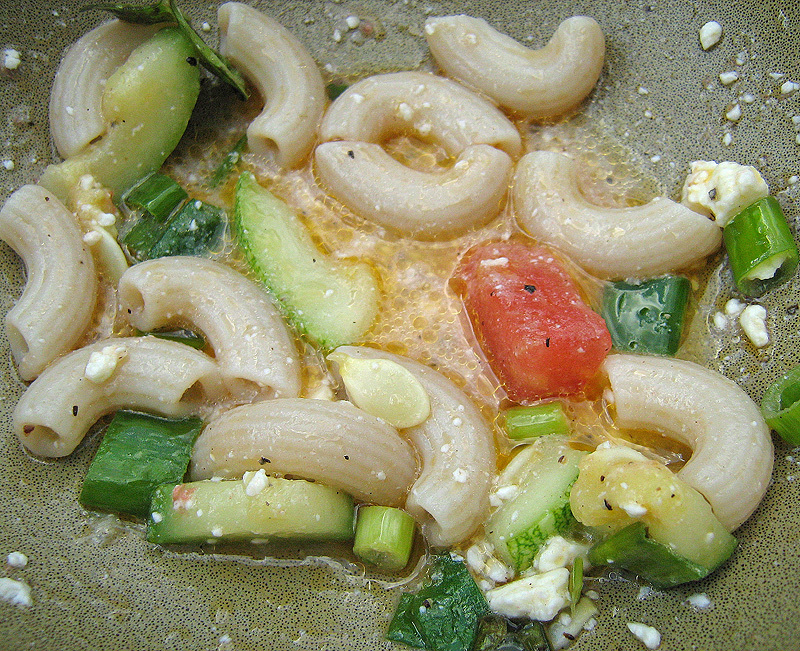 Drain pasta and veggies, but leave a little wet. Throw them back in the pan or in a large bowl and add other ingredients. Toss well & serve warm. Serves 4. Hints: Pre-cutting vegetables in batches is a huge time saver! Also, leaving a little pasta water after draining is a trick that “old school” Italian cooks like my grandma use to get a nice, light, sauce from all the melded ingredients. The bottom of the bowl will look something like this (and it will be delicious!) Grilled Italian or chicken sausages (I love Blinkski’s organic), grilled chicken, a salad and crusty wholegrain bread would all go nicely alongside.